This is the weekend of the Global Game Jam. And I'm laying laminate flooring. This not how it was supposed to turn out, but these things happen I suppose. As I was cutting and laying the lengths of fibreboard I was thinking that you could probably make game out of this. But trust me, nobody would want to play it. Global Game Jam is this weekend. Don't forget to sign up. Unfortunately I'm not sure how much time I'll have to get involved; I'm giving sessions at Platform Expo on Friday and we have a University Admissions Day on Saturday, but I hope to get down to the Horncastle Buildings at Hull College to take a look at what is going on. If you are in any way serious about getting into game development you should take part in as many Game jams as you can. They give you things to talk about at interview, intense game development practice and, sometimes, ideas that you can take forward to full blown products. And they are huge fun. The signup is only a fiver for the 48 hour event, so if you work out the cost per hour it's tiny. Sign up here. Game Developers Conference, or GDC, is probably the biggest gathering of game developers in the world. I've been lucky enough to go a couple of times and it is a fantastic conference. One of the attractions of the conference is the side-exhibitions that they organise. One is called alt.ctrl.gdc and it is a showcase for wacky game controllers and games with novel gameplay. It just so happens that a couple of years ago I was part of the Spooky Elephant - Beard Bandit team taking part in Global GameJam and we created a novel game with wacky game controllers. As you do. I've not got particularly fond memories of the actual competition to be honest. 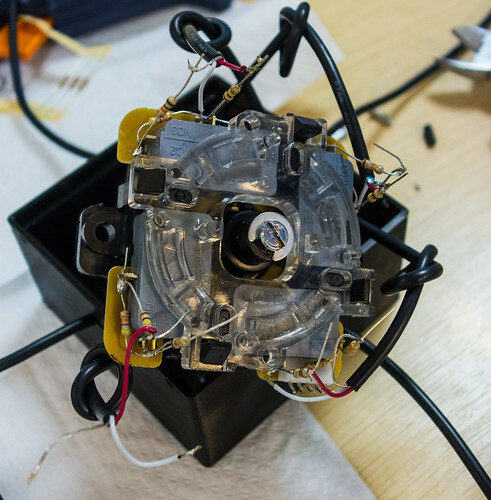 I was the single point of failure who's dodgy hardware design caused the project to falter. However, we did win an award for Most Ambitious Failure. But we are not ones to give up. Simon and Jon continued to work on the software and I did some modifications to the hardware, ending up with a working configurable joystick and a game to go with it. The great news is that last year Simon submitted the game and the joystick to the GDC organisers and the game has been selected for showcasing at GDC 2016. This of course means that someone from Hull has the chore of going to San Francisco and showing it off, but Jon has manfully stepped up to the mark and will be taking the hardware and the game to show off. You can find out a bit more about the game here. 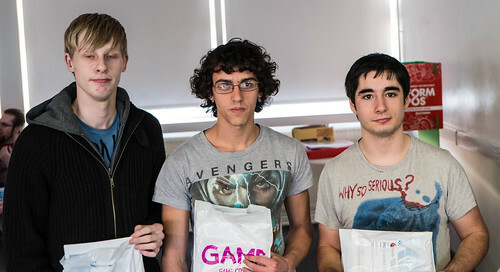 The Blimbu team being photographed with their prizes. I wasn't able to take much part in the Global Game Jam this year. Circumstances conspired to limit my involvement to transporting Hull students who wanted to take part over to Grimsby Institute, where the competition was held this year. From the looks of things the competition went really, really well. Kudos to the Grimsby team for running an excellent competition. 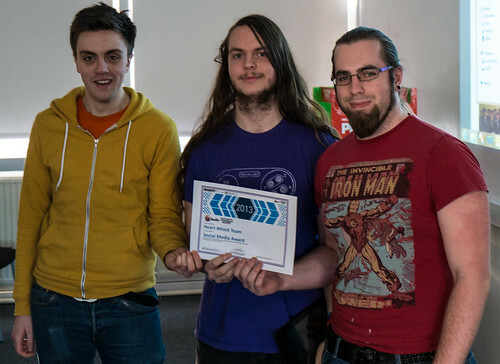 The winners of the event were Blimbu, who are Game Jam veterans and have been producing high quality games from the very first Global Game Jam in Hull a couple of years ago. You can take a look at the game that they made in only 48 hours here. There are two Rob Miles's working at the University of Hull. This can cause problems occasionally. As when you hear "We've ordered academic dress for Rob Miles to wear at the degree ceremony on Friday" and think that all will be well. Of course, that wasn't me. So I had to make do with a gown and cape that we grabbed from the returns, plus a hat that was strangely large. In fact I really wished that I'd spent some time practicing the Michael Jackson spin before the ceremony. I reckon that I could have done one of those without my hat actually turning. That would have been so cool. At least I think so. Anyhoo, hat problems aside (I gave up on the hat in the end as it kept falling off) we had a couple of really splendid ceremonies. It's always a bit nerve wracking getting everyone into line and doing the warm-up speech, but it was so worth it to see the looks on the faces of the graduates and their families. I took my usual pictures from the stage, they came out quite well. If you click through the pictures onto Flickr you can find the larger versions and seek out yourself. 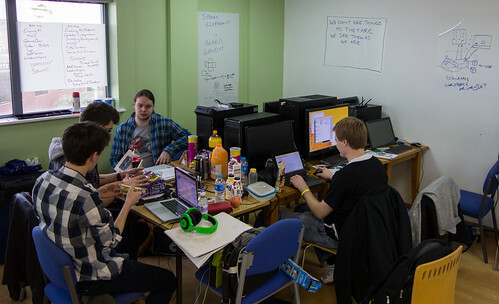 Global Game Jam is an amazing 48 hour game development event that runs worldwide (hence the name). We've had events in Hull over the last couple of years and this time the folks at Grimsby Institute are hosting the event. 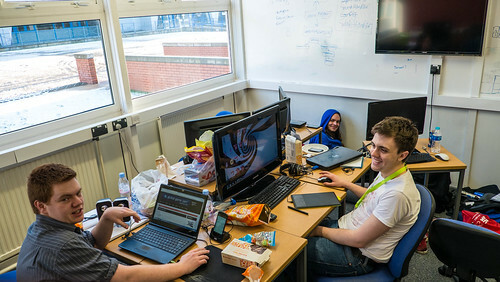 For those at Hull new to Global Game Jam; it is a bit like Three Thing Game but you all share the same theme. For those who don't know what Three Thing Game is like, you can find out here. We'll be organizing a "magic bus" to get us all to Grimsby and back (actually it will be quite an ordinary bus, but the magical part is that we will be paying for it - not you) and sorting cheap accommodation for the event. From a Hull University student's point of view the timing is pretty much perfect. The even runs over the weekend of the 23rd - 26th of January, just at the end of the inter-semester gap week, giving you time to get together with your team and sort out project management (see yesterday), toolchains and game plans. If you want to take part (and you really, really should) you can sign up here. It's taken me a while to get round to doing the final wrap up on the amazing Global Gamejam Hull 2014. I've been hunting down videos and pictures and I've still not got quite a full set, but I've got details of the top six finalists, and pictures of all the prize winners. So here goes. 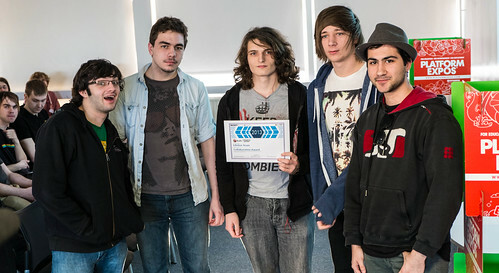 This is the awesome "Spooky Elephant - Beard Bandit Collective" which picked up the award for "Most Ambitious Failure". Oh well. This is 121 Gigabits with their "Best Presentation" award. Their game is superbly presented, and you can even download and play it. The Chips 4 Rent team came home with "Best Aesthetics"
The Disolveable Mammals and their prizes for "Most Ambitious Working Game". This is what remained of "Grown Up Games" by the end of the competition, and his "Last Man Standing" award. This is the sound man from 'Put a const on it' with his richly deserved "Best Audio" award. The "Stick Pixels" team were down for a while, but never out. So they were awarded "Best Comeback" for finishing with something awesome. These folks made their own trees from code. This earned "Put a const on it" the award for "Procedural Awesomeness"
These guys came third with a game that gave you a chance to experience life as a cat and see everything through feline eyes. With novel "scrabble powered" leap sensor movement control and sofas you could jump on, a great piece of gaming awesomeness. These folks put you in a godly position, planting and managing an algorithmically produced forest that grows and decays over time. With haunting music that changed with the gameplay and the ever present threat of winter, this made for some absorbing play. These folks took the concept of identity and made it into a retro-styled 2 player game where the object was to find yourself, and your opponent and then blow them away. With retro themed graphics and gameplay and a multitude of different modes this polished production looked ready for the shops and gained the team, a stalwart crew of Three Thing Veterans, First Place. You can download and play their game, just head over to their Raspberry Pi powered web site here. Of course, it's not really about the winning, it's about what you learn by taking part. This is particularly true of my experience, where I've learned that relying on hardware that you haven't tested is a particularly bad plan. It was great to see so many returnees, it was also great to see all the games that didn't make the top six. If you want to find out more you can find the judging videos here. If your video isn't online yet, then please be patient as I'll be transcoding and uploading them in the next few days. If you want to add your own videos, please do, and add the tag globalgamejamhull2014 so we can all find them. 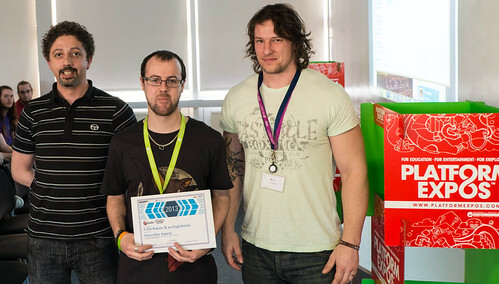 Thanks again to Platform Expo for organising everything, Hull College for a fantastic venue, Microsoft, Jagex and Sony for providing fantastic judges and prizes. And see you all next year. This component (the joystick) actually worked quite well, which is more than the rest of the system did. Make sure that you sort out any "stoppers" (things that must be there for your system to work) as soon as possible during a project. Don't make any assumptions about what you are making. Well, what's the point of making rules if you don't break them yourself every now and then? One major stopper would be if the controller was unable to talk to the control elements. The idea is that you have to plug your fire button and joystick into sockets on the controller and during gameplay the sockets will fail and you will have to switch to other ones. In other words, a big part of the game is plugging and unplugging elements of the controller. It's kind of important that this works. I'd assumed this would just work. It didn't. Plugging in a controller element caused the Arduino to crash, probably because as the plug goes into the socket it makes contact with power and ground signals and shorts them out. In a sensible world I'd have checked this all out right at the start, before building anything else. In my world I left it until the last minute to find out that my choice of hardware had doomed our project. Oh well. We did win a special "Judges Award" prize - Most Ambitious Failure. The controller will rise again. I'll post some pictures once I've got a design I'm happy with. The judging passed off very well, with our judges doing a sterling job, going round each team in turn. Each team had to make a 3 minute pitch for their entry, which was videoed. I'll post videos, pictures and full details in an event report later in the week, once I've got all the pictures back. I wasn't able to take any snaps of the winners as I was helping with the presentations and didn't have my camera with me. Anyhoo, the whole affair was most excellent and everyone was very keen to do it all again. 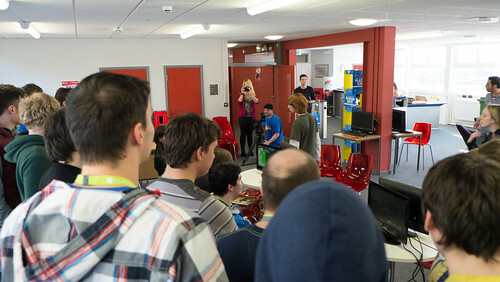 And I reckon that, since Grimsby College have been kind enough to come north of the river to visit us for the past two years, we should travel south next year and hold the Gamejam over there - if they would be happy to put up with us. With a bit of luck and a following wind, we can make that happen. Here's to 2015, and thanks again to everyone:: sponsors, organizers, judges, camera guys, security guards, pizza "disher-outers", general "make it workers" and of course the competitors, who made it so memorable. I'd thought it might be fun to make a novel kind of controller with elements that could be plugged or unplugged. The plan is to use an Arduino Leonardo device as the controller. This has the useful ability to behave like a usb keyboard or a mouse, and also provides a serial port that can connect to a process on a host PC. My idea was to use resistor networks in the controller elements so that the Arduino could identify particular a element by the voltage that it puts out. After purchasing some resistors and some tests by number one son the idea looked workable and so I set about designing the cases for the components. 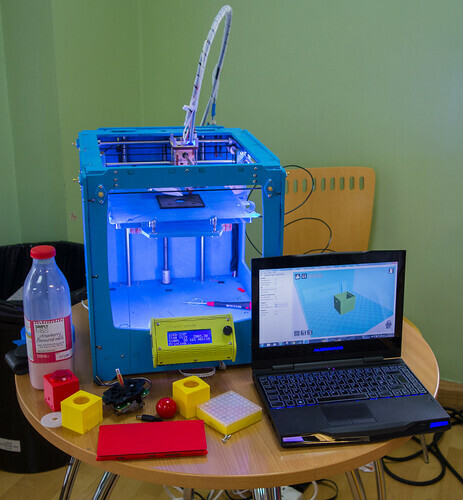 I'd taken Una the Ultimaker along and she was soon humming along making bits and bobs. We needed cases for the individual controls and the joystick, along with a larger box for the main controller which would house the Arduino and a led display that I planned to add. The rest of the team were working away busily and by the end of the day I'd got some of the boxes built and it looked like things were coming along nicely. Great fun. This year we've switched venues. We are in the Horncastle Building from Hull College, just across the road from the Hull Studio School were we were last time. The building is fantastic, and everyone has been wonderful, with lecturers giving up tables and chairs from their classrooms so that we can set up space for the developers in the dance studios in the building. And the Platform Expo crew have been busy setting up networking and power connections for all the teams. 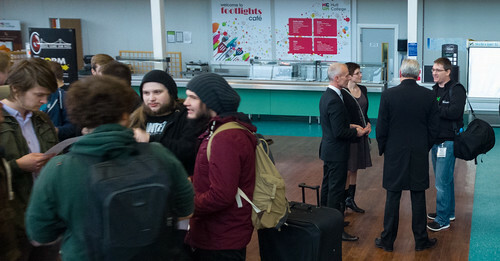 The Grimsby College students arrived on schedule and we all headed into the auditorium for the intro presentation from Simon. I took this shot as students were arriving, I couldn't take many during the show as I was showing the briefing presentations and the video that sets the all-important theme. We have around 120 students taking part from Hull College, Grimsby College and Hull University. The way that GameJam works is that they set a worldwide theme for the competition, and we have to make a game that matches the theme. This year the theme was the phrase "We don't see things as they are, we see them as we are". Deep stuff, raising profound questions about the nature of self and how we view the world. And certainly a bit tricky as the basis of that space shooter that I was planning to make, using a configurable controller that I was going to build, pretty much from scratch, in 48 hours. This year the "Beard Bandit" and "Spooky Elephant" teams have merged to produce a huge, eight person leviathan that will crush all before it. We have tentatively titled the collection "Elephant Beard", although this may change. Inventing a game to match the theme was a tricky task, and we continued the discussions long into the night. 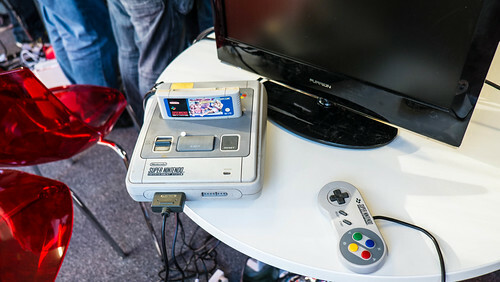 Simon was keen to make a multiplayer game which combined the attractions of Pacman and R-Type, along with a configurable controller to give an exploration of the human psyche. I could tell you more, but this would ruin the surprise when you actually play the game. Or something. With work progressing nicely I headed home. There was a time when I could work all night on projects like these, but that has passed I'm afraid. But I'll be ready for action tomorrow. 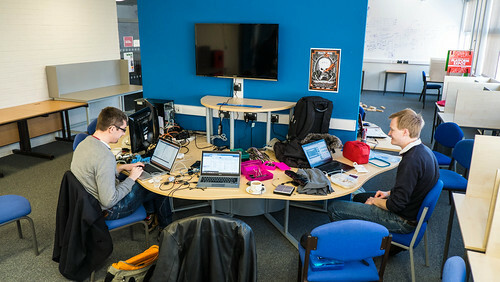 Hull Global Gamejam is moving.. Just down the road. 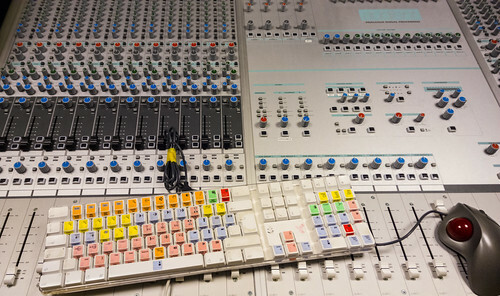 Last week, due to circumstances beyond anyone's control, the venue we used very successfully last year, Hull Studio School, suddenly became unavailable to us. But thanks to sterling work from Sarah at Hull College we now have a new location. And it looks to me like it is going to be even better. We are now at the Horncastle Building, which is just about across the road from the Studio School. It boasts a great open area, some dance studios we are going to fill with developers and a great place for serving pizza. 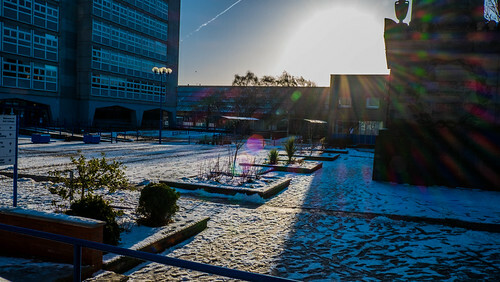 It is the home of Hull College of Creative Arts. I always tell students to enter all the competitions they can because, you never know what might happen. You probably won’t win. But then again, if you don’t enter you definitely won’t win. 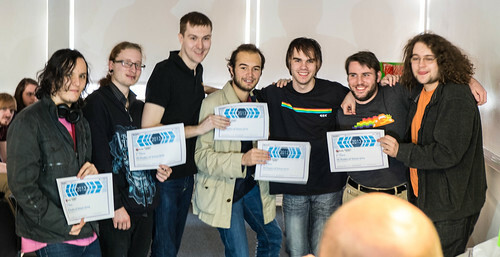 Simon, David, David, Lewis and myself formed a team to take part in the Global Game Jam earlier this year. The theme was heartbeats and, after a little discussion, we decided that a game which pits your heart against all kinds of incoming bad things might hit the spot. Our game was made even more interesting because we also managed to capture heartbeats and synchronise the gameplay to them, which was nice. After the competition was over David and Simon kept working on the game, submitted it to Windows Store and then entered it in a Microsoft competition. And we won. A Windows Phone, some cash, a T shirt, a nice pen and key ring each. And a chance to go down to Reading to visit Microsoft UK. Amazing. 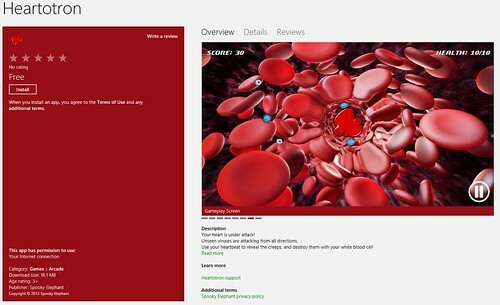 If you own a Windows 8 device you can get hold of our prize winning entry by searching the store for “Heartotron”. If you think you can do better, then enter next time…. Thanks so much to Microsoft to organising the competition and choosing our entry. Great stuff. I went round with one of the judging teams and took some of the videos, Simon did the rest. If you want to find them and take a look at the wonderful stuff that was built you can search YouTube here. At the time of writing some of the videos were still being uploaded, but they should all be online soon. After the judging, we had prizes. I took pictures of most of the prize winners, but for some reason I didn’t get pictures of everyone, sorry about that. First up we had the special awards. These are teams who have excelled in specific competition categories. Now it was time for the top three teams. The winners were “50 Shades of Simon Grey”, who designed, built and then textured an entire haunted mansion for their terrifying game where a ghostly presence stalks multiple players as they search the rooms to try and exorcise the evil that lurks there. The game uses 3D sound to play the hearbeat of the avenging ghost as he comes up behind you for the kill. Great,and very atmospheric, stuff. Then it was time to pack up and head out. Thanks to Simon and Tom for making it work, Hull College for letting us have the use of their amazing Hull Studio School venue and all the folks who turned up. A great time was had by all, and we will definitely do all this again. HullGlobalGameJam will be back. Once we’ve had a lie down…. This shows a tense moment in the game, you can’t see the amazing shader ripple effect, but when the game is running it looks amazing. I’ll see if we can put a video up somewhere. We got the game working. Thanks to Lewis for some stonking artwork and everyone else for the bits that they did. Which were many. It was really great to forget everything else for a while and concentrate on just one program. This is the first time I’ve actually done the development thing in one of our competitions. It definitely won’t be the last. When David drove us home last night we noticed that the snow was beginning to pile up. This morning there was a lot of it about. We managed to get into the GameJam around 8:00 am anyway, to greet Simon who had been up all night making the game. And we had a game, with the not too original name of “Heart Attack”. 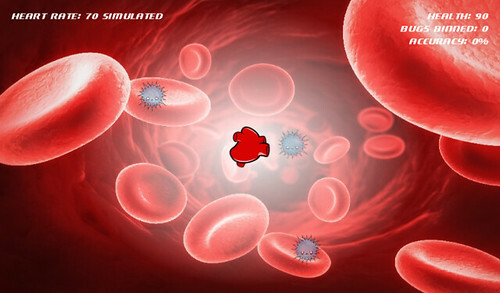 Bad things move menacingly towards a beating heart, which fires antibodies to dispatch them. Things are made even more interesting by the way that the baddies are only visible as the “pulse wave” of the players heartbeat passes by them. Simon assured us he could write a really funky shader that would show the effect. So we sent him home to bed and we set to work. The first thing to do was to get the heartbeat values out of the Gadgeteer device and into the game. Turns out that’s what USB serial ports are for and so after putting together a tiny serial protocol we had that working. Then it as just a matter of the two Davids and me creating assets and building gameplay and sound. Which was great fun. I did find time to take some pictures too. Inflatable bed, 10 quid from Tesco. Guess who’s using it…. You can find more shots here. 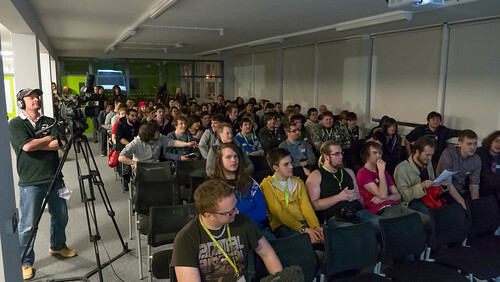 When we started off with Global GameJam Hull we were very worried that nobody would turn up. Every meeting ended with an anxious discussion focused on “Bums on Seats”. As you can see above, we ended up with plenty of folks, which was great. The competition started with a couple of excellent videos setting the scene (and reminding everyone about the power of deodorant) and then we got the theme. No pictures, no words. Just the sound of a human heartbeat. Genius. Then it was off to form teams and get cracking. I ended up in a team with two David’s and a Simon. We named ourselves “The Simon Grey Glee Club” and started casting around for ideas. During the discussion I mentioned that I happened to have a Gadgeteer Heart Rate Interface, although I’d lent it to James to do some Imagine Cup stuff. Could we make a game which made use of the heart rate of the player? The answer was yes, so I was instantly on the phone to James who was kind enough to swing by and drop off the hardware and his sample code. By the end of the evening I’d got the interface working and verified that we could get heart beats and pulse rates from it. Tomorrow I’ll make an interface to get those values into the game. I’m not working overnight on this, but I will be there really early in the morning. Another day, another room full of smiling faces. Or something. You can excuse the audience for looking a bit shell shocked. They had just sat through a whole bunch of game development stuff. I started proceedings, with a fifteen minute section that I retrospectively titled “Watching Rob fail to get his tablet to work in lots of different ways”. After I got a picture on the screen and a keyboard and mouse that worked (something that turned out to be surprisingly difficult and worthy of a blog post all to itself) I did some stuff about how easy it is to get MonoGamae working Windows 8. You can find my slides and sample code here. Then it was the turn of Simon to talk about good practice for game development and creating sprite sheets. Before this talk we had engaged in a game of “PowerPoint Chicken”. The game is very simple, the one who is the latest to have their slides ready for a presentation wins. I thought I was in with a good chance of winning, what with having my slides ready less than five minutes before the talk. Of course this left me no time to test my tablet, hence the pain at the start, Simon beat me easily, I think he was writing his deck while I was speaking. Which is probably cheating. Anyhoo, it all passed off well enough, with plenty of failing demos to keep the audience amused. A word from the wise here, PowerPoint chicken is a dangerous game. Finally Louis, one of our students, turned up and gave the best presentation of the day all about Unity. I’m really going to spend some quality time with this framework, it looks excellent. I’ll put slides and sample code from the other presentations later on. Now it is full steam ahead for Global Game Jam Hull. We have over 100 folks registered, a bus full of folks coming over from Grimsby, a load of our students. And some games to make.